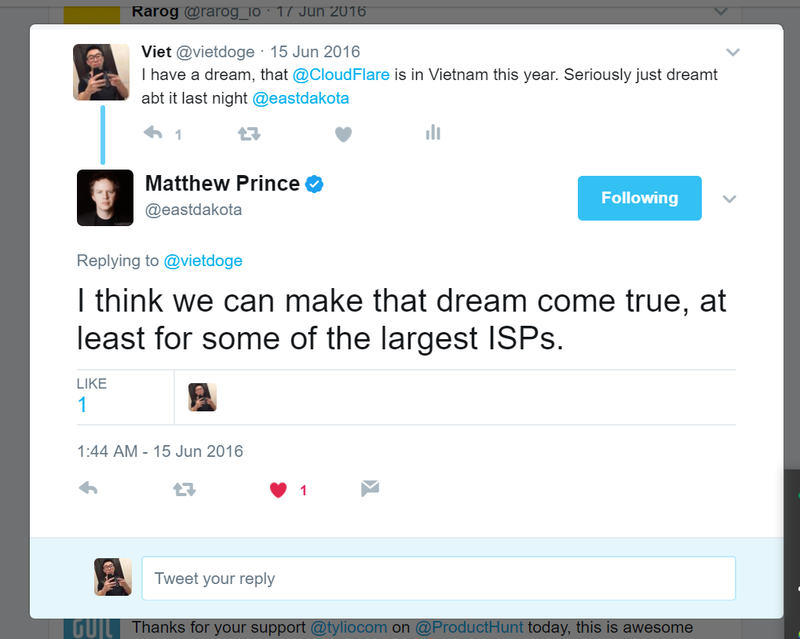 Exactly 1 year ago, I was wishing that CloudFlare would expand to Vietnam. There probably were some delays because of regulations and others. having CloudFlare in Vietnam would benefit the startup ecosystem greatly and free people from restriction of renting servers inside the country (which are not good in this cloud computing age). I hope that Matthew, Michelle and the CloudFlare Team can make it come true this year! It is definitely in the works. Can’t give a firm timeline but working on it for this year. Thanks! Very much looking forward to it! I very love CloudFlare and still looking for you in Vietnam, Thank you very much!!! I note that this post is a year old and still there are no data Cloudflare centers in Vietnam. Is there an ETA? We don’t have a timeline that we can share just yet. Stay tuned! It seems couldn’t work with Viettel and VNPT.